One of the reasons I started building Gunpla is because I saw photos of awesome, custom painted kits online and I wanted to make some of my own. That was the inspiration for my galaxy paint scheme—I loved modeler Johmny Iris’s version and wanted to try it out. Since Johmny’s blog is in Korean, I had to use Google translate to read about his process. After I got a general sense of his technique, I set about doing it myself. Modeler Johmny Iris’s take on the galaxy look. Source. The galaxy pattern requires a lot of open, blank space on a model. I thought about picking a Gundam with wings or a large shield, but ultimately I went with the HG Zeta Gundam Qubeley Revive—because the waist, arm, and leg armor, along with the shoulder binders, present a lot of open space at the front of the model. Additionally, the armor is overall more curved and wraps around the front and rear. This is the same model Johmny Iris chose, most likely for similar reasons. You’ll notice I did not paint every part of the model with the galaxy pattern—I put it on the most visible parts for emphasis. So the first thing I did was prime those parts for painting. I began with a layer of Alclad 2 Medium Grey primer. I always begin a custom paint job with primer, because it makes the paint stick to the model better than it sticks to plastic. Next, I wet-sanded the primer. I soaked 800 grit sandpaper in water and then sanded any spot where the primer was uneven or a little rough. After that, I touched the wet-sanded spots up again with more primer. Wet-sanding makes the primer layer nice and smooth, which is important because the finished product is glossy, and gloss highlights imperfections. It’s always a good idea to wet sand your primer layer, but especially if you’re going for a glossy finish. Next, I sprayed the base color, Mr. Color Lacquer Susie Blue, using my trusty Iwata Eclipse (HP-CS) airbrush. Once it dried, I used Mr. Color Lacquer Pink to spray some lines. There was some overspray, which looks like little pink dots. If that happens, don’t worry about it—the next step will cover those dots with black paint. Additionally, because of the random nature of this paint scheme, small imperfections actually enhance the look and add to the effect. To achieve this cloudy look, I sprayed Mr Color GX Ueno Black through a piece of poly blend cotton. You can use any kind of artificial cotton designed for stuffing cushions or quilts. This step takes some experimenting because you want to pull the cotton apart just enough to let paint through, but still enough to sort of mask the part you’re painting. You don’t have to be perfectly consistent with how much you pull the cotton apart because the variance in thickness of the cotton will give you different densities in your black clouds. One place to look for inspiration are real Hubble Telescope photos. If you look at these pictures, you’ll notice nothing is symmetrical or perfect, and that’s what we’re going for here. Here are a couple of experiments. On the left, the cotton is pulled apart slightly. On the right, the cotton was pulled more before painting. You can see the cotton that was only pulled slightly lets less paint through and shows more of the base color. The cotton that was pulled more lets more paint through, and gives a thicker cloud effect with more distinct lines. After I pulled the cotton to my liking, I wrapped it around the pieces, which I secured with alligator clips. That way I could assure it would stay in place while I painted. Once I had the black clouds painted, the next step was to add stars. This is the most basic technique out of the whole tutorial, but it’s the hardest to execute. To get small specks of white onto the model, you spray air from your airbrush through a paintbrush loaded with white paint. The tricky part is figuring out how much to load into the paintbrush and how far to hold your airbrush away. I found it was best to dip my paintbrush directly into the paint pot (without using any paint thinner), dab it on a bit of paper towel, and blow air at 20 psi from 4-6 inches away, starting with the airbrush further away from the tip of the paintbrush and moving closer as the paint leaves the paint brush. This takes a lot of practice, and I recommend you don’t do it onto your model until you practice on paper or plastic spoons to get an idea of how to get the spatter pattern you want. I finished by adding some decals and making a custom base (from a shadow box, cotton, a name tag, and a battery-powered set of cheap LEDs). Looking back, the one thing I’d do differently is make the patterns match where the armor pieces come together. If you look at the seams where the back and front armor come together, the patterns break because I painted everything separately and randomly. What I should have done is make the pink lines and black clouds run consistently between pieces that touch, especially between the shoulder binders and leg armor. But overall, I’m very happy with my results and I look forward to seeing what other people do with this paint scheme! 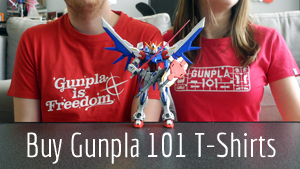 Vincent has been working with Gunpla models for almost 2 years. You can find his work at www.vgunpla.com. When he’s not working Gunpla he spends time with his wife, Alish and his adorable Boston Terrier, Sophie. Whatever time is left he devotes to his Nintendo Switch. He recently moved to Boise, Idaho and is discovering how great it is to be close to mountains again!